What Good is a Dinghy Davit on My Swimstep? 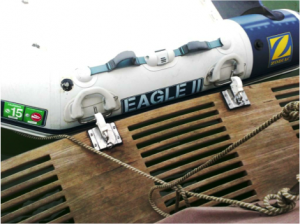 Home | Forespar Products in Use | What Good is a Dinghy Davit on My Swimstep? The obvious benefit is the ability to hoist your inflatable dinghy up on the swimstep while it’s inflated. That way, you’re not fighting to unroll, inflate and float the dinghy using the limited deck space on a small to medium sized boat, and then reverse the process. Often, that means you’re spending as much time setting up the supposedly convenient dinghy as you did on the voyage. Plan B is to tow the dinghy. For a longer trip, especially at sea, this can be an adventure of its own. Speed, tow distance from the boat, cleats (often not designed for those loads) and tow lines and yokes can be a real pain. We haven’t even mentioned the motor, gas can and cargo. With the swimstep davit system, you can simply bring the dinghy alongside, clip it on and tilt/hoist it in. A side and actually major benefit is overnight stays. By clipping the dinghy into the Davit, we can be sure that it sits quiet in the water. There’s no banging on the hull, drifting into the fairway, worrying about the painter, etc. Easy passenger boarding from the swimstep, and easy back onto the boat. We’re using the Forespar QuikDavit ™version on two boats. One on the Grand Banks, used for hoisting and parking the smaller dinghy, and with the mounting pads the same distance apart for docking the bigger Caribe. The Wellcraft uses the full QuikDavit kit as designed. It is easy for Pat (the real Skipper) to use, and was easy to install on both the wood step and the thicker step on the smaller boat. It makes for a much more pleasant cruise, and has proven to be well worth the money. Mike Dwight January 7, 2016 Category: Forespar Products in Use.